When you are asked to build a home for what a client considers his life’s work, you know the expectations are high, and should therefore be absolutely perfect. Our excellent Washington wine cellar design expert faced this challenge when they were asked to create a wine room for the owner and winemaker of Woodward Canyon Winery in Walla Walla, WA. The client’s huge collection of wines deserved a spacious, stunning wine room that represented his life’s work, and this is exactly what our specialist gave him! An amazing 15,000 “bottle storage library” was created for him to house his vintages which trace back to 1981. The room is literally a wine lover’s playground — front room racking done in gorgeous Redwood stained in dark walnut. 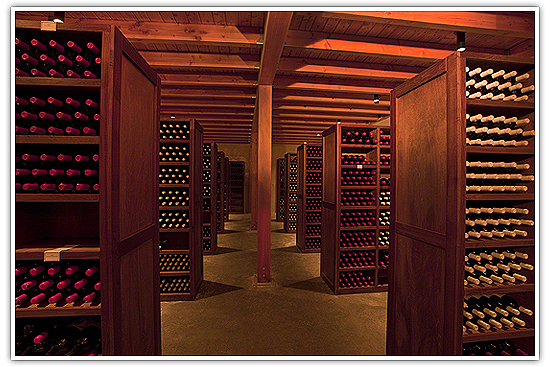 Redwood, as you may already know, tops the list of best wood types to use for wine cellars. Stained or not, Redwood wine racks are truly beautiful and stand the test of time. This is wine heaven if you ask us. There are double-display rows and an exquisite setting for a unique future banquet experience. We love the chandelier and the accent lighting behind the display row valances that complement the dark racks. Showing off wine storage at its best, this room has racking styles designed for maximum storage. Bulk bins allow for vintage groupings and individual bottle racking provides for inventories of special lots and cataloging! Going around this huge wine room really is like touring a library, except that you don’t find books, but an array of wine bottles! Truly a stylish wine library, our Washington State wine storage expert did a fabulous job of custom designing hallowed hallways with bulk bins that are double-sided with fully interlocked shelves and full length finely interlocked face frames. Yes, it’s all about the numbers here. The more bottles of wine, the merrier! 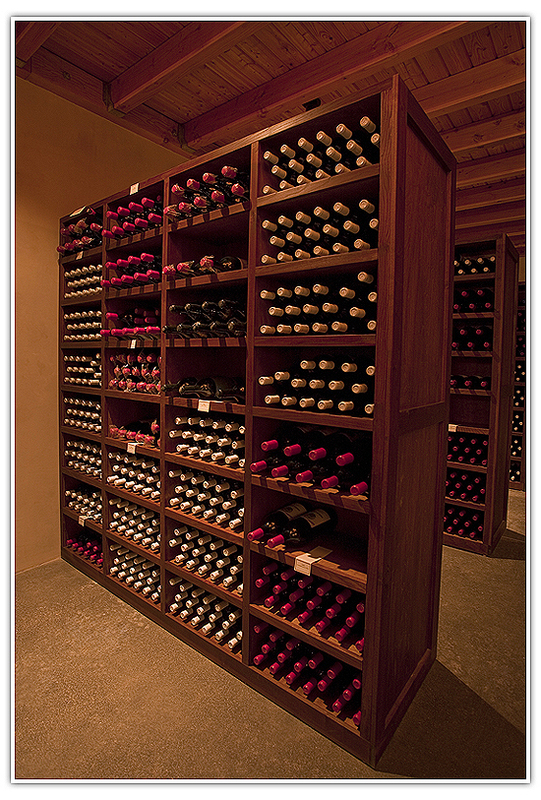 Because this wine room is huge and is therefore all about bulk, special attention was given to the bulk bins. Each bin is engineered to comfortably contain the maximum weight of 3800 pounds of bottle capacity. To match the front room display, solid hardwood face frames and hardwood veneer shelves and case goods were also stained in a dark walnut. The result? 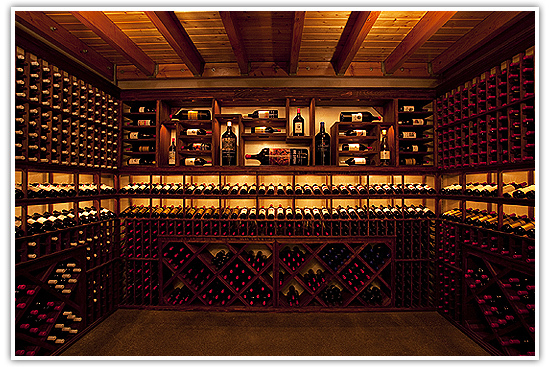 A wine cellar/wine library that’s every wine collector’s dream! 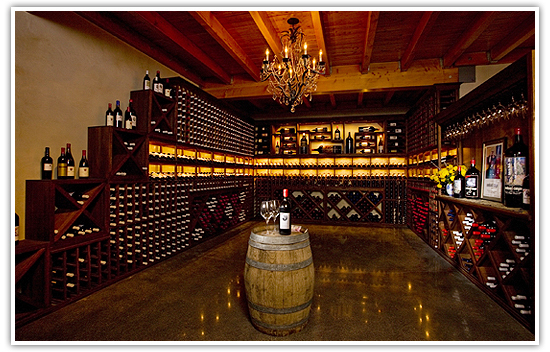 If you need help with a commercial wine storage project just like this, we would love to help you!